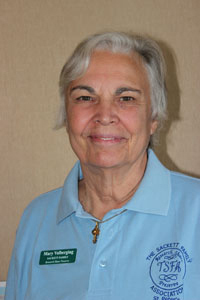 "I nominate Jean Carpenter (member #132) to the Sackett Family Association Committee. Jean has been a member of TSFA since 2008, during which time she served as a Committee member. Jean also served as Association Registrar and Mailing List Administrator from 2011–2014. Jean's sister, Katy Menon, is a Sackett Family Association member. 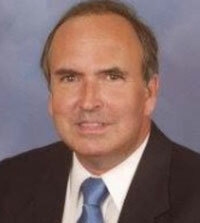 Her brother, Michael Leroy Trickey (1946–2013), was also a member. Jean has attended TSFA Reunions in Boston (2006), Fort Wayne (2007), Thanet, England (2008), Vancouver (2010), Westfield (2012), and Fort Wayne (2015). Jean grew up in the Midwest and attended Baylor University, where she met her future husband Bill (now deceased). Her professional career was in editing and publishing. She worked for most of those years for a mathematics education association. Bill served in the Air Force, which provided many opportunities for the couple to live in a number of places. Jean has been a resident of northern Virginia since 1986. Her three children live in California, Texas, and Georgia, and her siblings live in Kansas and Texas, giving her lots of opportunities to travel. Jean has been retired since 2003. Jean's interest in family history peaked in 1969, when her family moved to the Washington, D.C. area and she and Bill discovered the National Archives. They both were fascinated with searching for and finding records of their ancestors as well as finding census and military records for people they knew or had known. Family history has been Jean's obsession ever since. Jean has consented to her nomination for either the Class of 2019 or the Class of 2020, wherever she is most needed." See also Jean's Association member page. "I am willing to serve in the Class of 2020. I am submitting my 150+ page application to the Winthrop Society next week. I expect it to be easily approved—it has proofs for 13 unbroken linked generations! The Society informed me that Simon and Isabel Sackett of NewTowne, now Cambridge, Massachusetts, are both approved ancestors and my application is the first using them as so. It will open the door for a lot of their descendants in our family to also join." See also Richard's Association member page. Chuck has served on the Association Committee since 2014 and offers himself for re-election. As well as his interest in Sackett family history, he is much involved in community affairs in Warren, New Hampshire, including serving as a selectman in the town. See also Chuck's Association member page. "I nominate Mary Volberding (member #502) to the Sackett Family Association Committee. Mary has been a member of TSFA since 2015 and has actively participated in Association activities for many years prior to that time. Mary has attended TSFA Reunions in Thanet, England (2008), Westfield (2012), and Fort Wayne (2015). She currently serves as a member of the 2018 Reunion Planning Committee. Although Mary is not a Sackett descendant, she researches the lineage of her fiancé, Michael James Sackett (TSFA member #173). Mary is a resident of Scottsdale, Arizona. When not doing genealogical research she and Mike enjoy dancing and traveling. Mary has consented to her nomination for either the Class of 2019 or the Class of 2020, wherever she is most needed." See also Mary's Association member page. Terri has served on the Association Committee since 2013 and offers herself for re-election. 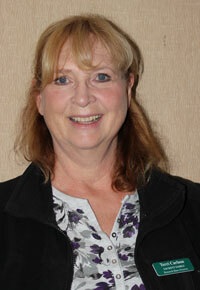 She is the Association's Registrar and administers the mailing list. She also serves as a member of the 2018 Reunion Planning Committee. Terri attended TSFA Reunions in Westfield (2012), and Fort Wayne (2015). See also Terri's Association member page. Chris was a founder member of the Association and has been much involved in Association affairs over the years, serving in various roles. 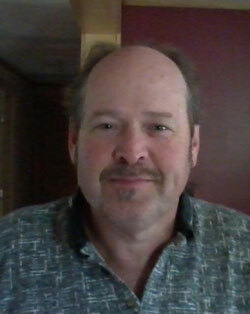 He is the webmaster for the Association website. He offers himself for re-election. See also Chris's Association member page.